Palabras clave: Neurorrehabilitación, lesión medular, multidisciplinar, nuevas tecnologías, calidad. Cáceres, S. et al. (2017): “Aplicación de las nuevas tecnologías en la rehabilitación del lesionado medular”. 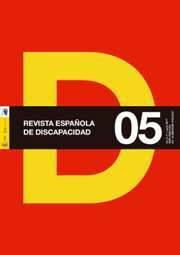 Revista Española de Discapacidad, 5 (I): 229-236. Fisioterapeuta y coordinadora de Rehabilitación en el equipo del departamento de Rehabilitación en la Fundación del Lesionado Medular. Fisioterapeuta y terapeuta ocupacional. Ejerce su actividad profesional como coordinadora de Terapia Ocupacional en el equipo del departamento de Rehabilitación en la Fundación del Lesionado Medular. Terapeuta ocupacional en el equipo del departamento de Rehabilitación en la Fundación del Lesionado Medular. Fisioterapeuta en el equipo del departamento de Rehabilitación en la Fundación del Lesionado Medular. Fisioterapeuta y coordinadora de Fisioterapia en el equipo del departamento de Rehabilitación en la Fundación del Lesionado Medular. Bronnikov, V. A. et al. (2016): «Evaluation of motor skills recovery in post-stroke patients in the process of complex rehabilitation with the use of robotic kinesiotherapy”. Zh Nevrol Psikhiatr Im S S Korsakova, 116 (9): 30-34. Calabrò, R. S. et al. (2016): “Robotic gait rehabilitation and substitution devices in neurological disorders: where are we now?”. Neurol Sci, 37 (4): 503-514. Cano de la Cuerda, R. (2016): “Frenkel: ¿un precursor de la neurorrehabilitación?”. Revista de neurología, 63 (2): 79-84. Diez-Alegre, M. I. y Cano de la Cuerda, R. (2012): “Empleo de un video juego como herramienta terapéutica en adultos con parálisis cerebral tipo tetraparesia espástica. Estudio piloto”. Fisioterapia, 34 (1): 23-30. Dimbwadyo-Terrer, I. et al. (2016): “Upper limb rehabilitation after spinal cord injury: a treatment based on a data glove and an immersive virtual reality environment”. Disabil Rehabil Assist Technol, 11 (6): 462-467. Fasoli, S. E. et al. (2003): “Effects of robotic therapy on motor impairment and recovery in chronic stroke”. Arch Phys Med Rehabil, 84: 477-482. Fazekas, G.et al. (2016): “New opportunities in neuro-rehabilitation: robot mediated therapy in conditions post central nervous system impairments”. Ideggyogy Sz, 69 (5-6): 148-154. Ferreira dos Santos, L. et al. (2016): “Movement visualisation in virtual reality rehabilitation of the lower limb: a systematic review”. Biomed Eng Online, 15 (Suppl 3): 144. Gil-Agudo, A. et al. (2016): “Interactive virtual feedback improves gait motor imagery after spinal cord injury: An exploratory study”. Restor Neurol Neurosci, 34 (2): 227-235. Hamanami, K. et al. (2004): “Finding the optimal setting of inflated air pressure for a multi-cell air cushion for wheelchair patients with spinal cord injury”. Acta Med Okayama, 58 (1): 37- 44. Han, E. Y. et al. (2016): “Robot-assisted gait training improves brachial-ankle pulse wave velocity and peak aerobic capacity in subacute stroke patients with totally dependent ambulation: Randomized controlled trial”. Medicine (Baltimore), 95 (41): e5078. Hesse, S. et al. (2003): “Upper and lower extremity robotic devices for rehabilitation and for studying motor control”. Curr Opin Neurol, (6): 705-710. Hilderley, A. J. et al. (2016): “Comparison of a robotic-assisted gait training program with a program of functional gait training for children with cerebral palsy: design and methods of a two group randomized controlled cross-over trial”. Springerplus, 5 (1): 1886. Hussain, A. et al. (2016): “Self-Paced Reaching after Stroke: A Quantitative Assessment of Longitudinal and Directional Sensitivity Using the H-Man Planar Robot for Upper Limb Neurorehabilitation”. Front Neuroscience, 10: 477. Institut Guttman (s. f.): Lesión medular (en línea). http://www.guttmann.com/es/treatment/lesion-medular, acceso 17 de febrero de 2017. Klamroth-Marganska, V. et al. (2014): “Three-dimensional, task-specific robot therapy of the arm after stroke: a multicentre, parallel-group randomised trial”. Lancet Neurol, 13 (2): 159- 166. Krishnan, V. et al. (2016): “Robotic-assisted locomotor training enhances ankle performance in adults with incomplete spinal cord injury”. J Rehabil Med, 48 (9): 781-786. Lo, C. et al. (2016): “Functional Priorities in Persons with Spinal Cord Injury: Using Discrete Choice Experiments To Determine Preferences”. J Neurotrauma, 33 (21): 1958- 1968. Louie, D. R et al. (2015): “Gait speed using powered robotic exoskeleton after spinal cord injury: a systematic review and correlational study”. J Neuroeng Rehabil, 12: 82. Maggioni, S. et al. (2016): “Robot-aided assessment of lower extremity functions: a review”. J Neuroeng Rehabil, 13 (1): 72. Pérez Seco, M. et al. (2014): “Virtual Reality in Rehabilitation”. Journal of Accessibility and Design for All, 4 (3): 223-237. Roosink, M. et al. (2016): “Interactive virtual feedback improves gait motor imagery after spinal cord injury: An exploratory study”. Restor Neurol Neurosc, 34 (2): 227-235. Soldevilla, A. et al. (2008): “Impacto social y económico de las úlceras por presión. Enfermería y Úlceras por presión: De la Reflexión sobre la Disciplina a las Evidencias en los Cuidados”. Grupo ICE – Investigação Científica em Enfermagem, 275-297. Stillman, M. D. et al. (2017): “Complications of Spinal Cord Injury Over the First Year After Discharge from Inpatient Rehabilitation”. Arch Phys Med Rehabil. Vasilchenko, E. et al. (2016): “A descriptive study on the functioning profile of patients with spinal cord injury in a rehabilitation center in Russia”. Spinal Cord, 55 (5): 489-496. Vesia, M. et al. (2008): “Correlations of selected psychomotor and visuomotor tests with initial dynavision performance”. Perceptual and Motor Skills, 107 (1): 14-20. Wells, A. J. et al. (2014): “Reliability of the Dynavision™ D2 for Assessing Reaction Time Performance”. J Sports Sci Med, 13 (1): 145–150. Yang, H. E. et al. (2016): «Structural and functional improvements due to robot-assisted gait training in the stroke-injured brain”. Neuroscience letters, 637: 114-119. Zárate-Kalfópulos, B. et al. (2016): “Demographic and clinical characteristics of patients with spinal cord injury: a single hospital-based study”. Spinal Cord, 54 (11): 1016-1019.